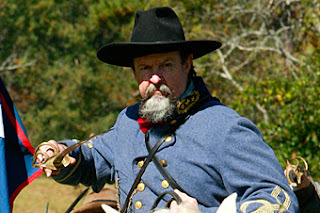 Confederate Memorial Park and the Alabama Historical Commission are pleased to announce our annual Civil War Living History & Saturday Skirmish taking place on April 27-28, 2018. Confederate Memorial Park is the original 102-acre site of Alabama's only Confederate Veterans' Home. The site operated from 1902-1939 as a haven for disabled or indigent veterans of the Confederate army, their wives and widows. Today, our state-of-the-art museum showcases Alabama's Confederate soldier from enlistment to aging veteran and contains hundreds of artifacts from the Civil War period. On Friday, April 27 from 9:00 am - 1:00 pm, students (and the public) will experience “up close and personal" outdoor living history demonstrations performed by authentically uniformed & equipped Union and Confederate reenactors. Civil War Camp of Instruction including barracks; officers quarters; commissary; guard house (see image attached). Admission to all outdoor activities is FREE. Admission charged to visit the museum. Schools can visit the state-of-the-art CMP museum at the group admission rate of $2.00 per person – limited to twelve groups on Friday (contact museum for reservations). No reservations necessary on Saturday; Special Saturday reduced museum admission $2 per person. On Saturday, April 28 from 10:00 am - 1:00 pm, visitors will experience more “up close and personal" outdoor living history demonstrations as well as a Civil War Skirmish at 1:00 pm. For more information, museum reservations, souvenir purchases, or other details contact the Park at 205-755-1990 or chappelle.cmp@gmail.com. The park also offers free self-guided tours of the site of Alabama’s only Home for Confederate veterans including two cemeteries where 298 veterans rest along with 15 veteran's wives and widows. The site showcases a nature trail which combines an Alabama “Treasure Forest” with features from the Soldiers’ Home. Confederate Memorial Park is an historic property of the Alabama Historical Commission and is located at 437 Co Rd 63, Marbury, AL 36051.